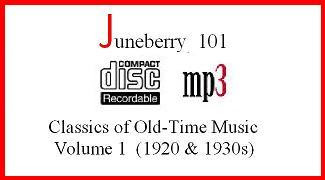 We are happy to announce two new Junberry78s compilations. Juneberry 105 contains recordings by such performers as the Cartwright Brothers, Parker and Woolbright, Uncle Am Stuart, Jimmie Johnson, John Hammond, Domino George and other wonderful artists. Juneberry 106 contains recordings by John Baltzell, Watts and Wilson, Samantha Bumgarner, Eva Davis and many others. We include the entire Gid Tanner and his Skillet-Lickers Columbia catalog. It is interesting to hear how they changed from a group playing old minstrel songs to the wonderful fiddle duets when Lowe Stokes (un-credited) joined them. Riley Puckett's singing is outstanding through all of their records. As we dig deeper into the archives we come across more acoustic recordings, as well as records that are more worn and have more background noise than we would like. The acoustic recordings have a poorer sound quality than the electric recordings than began later in 1926. However, there is still a great deal of wonderful music to listen to and learn from. We have more issues planned.